Australian Lychee Growers Association represent the biosecurity interests of lychee growers and the industry. 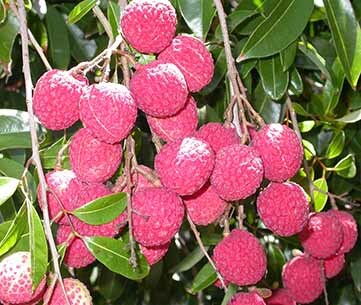 The lychee (Litchi chinensis) is a subtropical tree from the Sapindaceae family and is thought to be native to southern China. The lychee is an evergreen tree which grows to heights of more than 20 m. The lychee fruit is a drupe, 3–4 cm long and 3 cm in diameter, covered by a pink/red roughly textured rind which covers an inside layer of sweet and sour, translucent white flesh which surrounds the inner seed. Although variable between growing regions, flowering usually occurs over a 6 week period from between July to October. 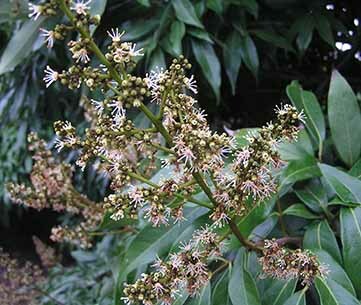 Flowers are borne on multi-branched terminal inflorescences, which are generally referred to as flower panicles. A panicle can have up to 3,000 flowers, although only about 200 are pollinated and of these only 5 to 60 will develop into mature fruit. There are three distinct flower types, two male types and one female, which are all borne on the same panicle. The usual sequence of flower opening, which occurs over a 2 to 6 week period, is male flower, female hermaphrodite flowers which set fruit, and male hermaphrodite flowers that do not set fruit. 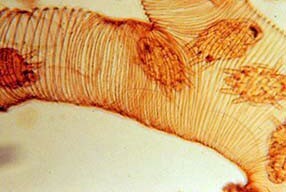 The male flowers in the first and third stages release pollen to fertilise the female flowers. Thus, there needs to be an overlap of the male stages with the female stage. Most of the pollen used for fertilisation is usually supplied by the third stage male hermaphrodite flowers. Self-pollination may occur in lychee through wind pollination however, flowers are generally recognised as self-sterile and insects are beneficial because they can transport pollen from anther to stigma for fruit to set. Only partial overlapping between male and female flowering occurs within a cultivar and so inter-planting of at least two different cultivars is necessary for adequate fruit set. Several insects have been reported to visit lychee flowers overseas including Coleoptera, Hemiptera, Homoptera and Lepidoptera. However, the honey bee is widely recognised as the principal pollinator. 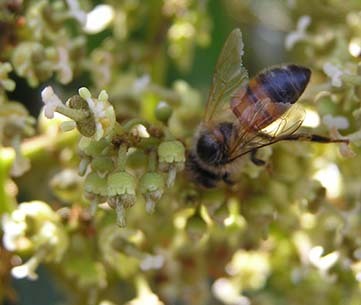 In Australia, both honey bees and Tetragonula sp are found on lychee blossoms, but preliminary studies suggest that the native social bee (Tetragonula sp) may be too small to be effective pollinators of the fruit. Many studies have shown significant increases in yield of lychee crops as a result of honey bee pollination, including fruit set being three times greater when inflorescences were open to honey bees when compared to trees that were bagged to exclude them. Lychee yields can sometimes be unreliable, erratic and rarely approach the capacity of the tree. Crossed fruit are generally heavier and yields in rows with two cultivars adjacent to each other have been shown to be 36 per cent higher in lychee. All of these studies clearly show that lychee require at least one other cultivar and an abundance of insect pollinators for pollen transfer to assist with pollination by wind. Bringing in honey bee hives could be necessary to increase pollinator numbers, increase crossing between cultivars and produce a good quality yield. For this reason, it is recommended that 2-3 hives per ha would be adequate for optimal pollination of lychee. Additional fact sheets and web links about the pollination of this crop are listed below. Please be aware that some of the information was developed overseas, and environmental and seasonal variations may occur. The pollination information is an excerpt from the Lychee and longan pollination fact sheet, The Pollination Program (Rural Industries Research and Development Corporation and Horticulture Australia Limited) and from personal communication with James Drinnan (Queensland DAF) and the Australian Lychee Growers’ Association.